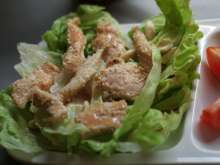 Salad is rich in protein and folate. 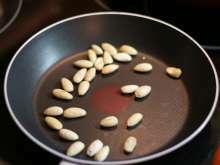 Fry peeled almonds on a smaller pan until golden brown. Put strips of chicken breast into the bowls. 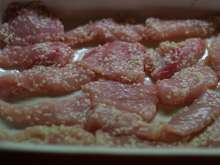 Season with salt and sprinkle with sesame seeds. Mix until seeds stuck to the meat. Lay slices of a meat on a greased baking pan. Put the baking pan in the oven, bake for 30 min. 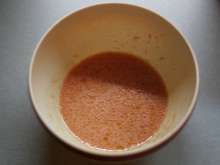 Prepare the dressing by mixing oil, orange juice and mustard. Put lettuce to plates, lay chicken strips and toasted almonds on the top. Sprinkle with prepared dressing.